Corvus Umbranox is the Count of Anvil and Countess Millona Umbranox's husband who has been missing for ten years. At the end of the Thieves Guild Questline he is revealed to have been the Gray Fox and the mysterious Stranger, both identities caused by the curse of the Gray Cowl of Nocturnal. After The Ultimate Heist, Corvus will pick up the typical life of a nobleman and will spend all his time with his wife. At 6am, he will actively seek out Millona and follow her around until 8am. 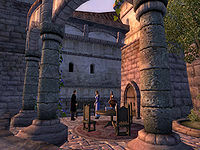 At 8am Corvus is in attendance in the Anvil Castle Great Hall until 4pm, when he returns to the royal quarters. At 8pm he will attend the castle banquet in the dining hall until midnight. Between midnight and 6am he was supposed to sleep, but due to a bug, he will instead just stand next to the bed. On Loredas and Sundas he will spend his evening on the castle balcony between 5pm and 8pm, presuming it is not raining. Unlike his masked alter-ego, Corvus wears the fine clothing of a noble, including a black & burgundy outfit and a pair of gold trimmed shoes. He carries a red velvet garment though he will not wear it. Corvus also carries a leveled amount of gold and a leveled longsword. 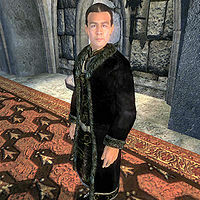 Before his return, Cyrodiil's nobility seems to have a rather low opinion of Corvus. When speaking of him, they will say: "Millona Umbranox is better off without that irresponsible husband of hers. The most honorable thing he ever did was to disappear and leave her alone. ", "I've never heard the Countess mention her husband. I believe it is something of a sore spot with Lady Millona." and "Millona Umbranox, Arriana Valga and Narina Carvain seem to rule their counties perfectly well without male assistance." Approaching Corvus while wearing the Gray Cowl of Nocturnal will result in a unique greeting, "The new Gray Fox. The cowl suits you. Me? I am much happier without it." Donning the Cowl in front of Millona nets you a more aggressive answer: "Leave my husband and I alone, Gray Fox. Your presence only stirs up evil memories." Corvus' unexpected return barely causes a stir among the Anvil townsfolk. The only comment can be found at the Flowing Bowl, courtesy of Innkeeper Maenlorn. Before his return, Maenlorn will say: "The Count went missing about ten years ago. No one knows what happened to him. Lady Millona rules County Anvil. Her Ladyship has no intention of remarrying. Liked her first Count well-enough, I guess, and doesn't fancy a replacement." Later on, he will be quite puzzled: "The Count went missing about ten years ago... but just recently he reappeared. It's a bit of a mystery, but the Countess seems pleased." With the Thieves Den official download installed you will find a set of four books comprising the Journal of Captain Torradan ap Dugal. Dugal was a notorious pirate who terrorized the Abecean Sea during the time of the Camoran Usurper. After the war, he was defeated by Commodore Fasil Umbranox, who was presumably rewarded for his feats with the title his descendant Corvus still holds. After The Ultimate Heist, Corvus is given a standard set of available rumors and will even say: "Can you believe that a thief broke into the Imperial Palace itself!" the exact rumor you receive after his final quest. If one breaks down The Count's hereditary name into 'Umbra' and 'Nox', one can translate both words from Latin to English, to make 'Shadow' and 'Night', respectively. His first name means 'Crow' or 'Raven' in Latin. A fitting name for a former Master Thief. Although Corvus claims to have had his name removed from all written records as a result of Nocturnal's curse, Guide to Anvil still mentions him directly by name. While Corvus Umbranox is scheduled to sleep between midnight and six, the Anvil Royal Bed has been assigned ownership solely to his wife, preventing him from sleeping in it. If you ask Corvus Umbranox about rumors, it's possible he may say "Count Umbranox has returned! After eleven years, he just walked back into Anvil." talking in third person. ? This page was last modified on 10 February 2019, at 11:33.